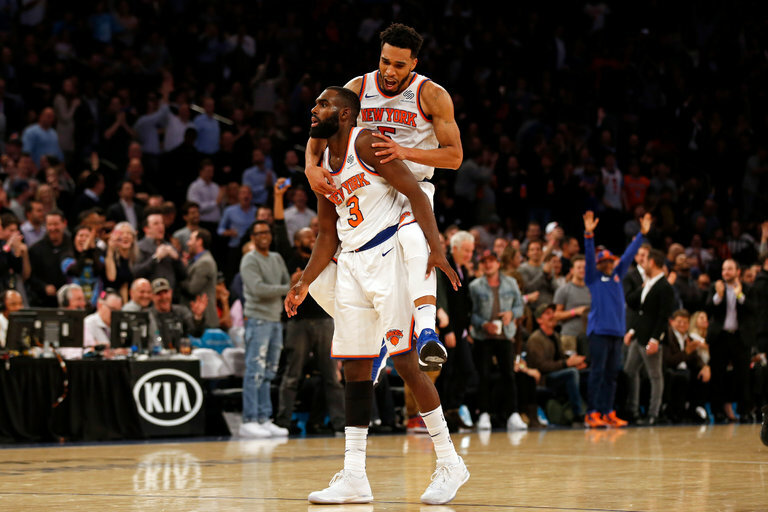 The Knicks have been a welcoming and pleasant surprise to the NBA season. The team plays hard, hustles and tries on defense game in and game out. Sure, they are not the most talented players and sure there are questions about the roster and salaries given out to players but there is a different vibe around this Knicks team as opposed to years past. Preseason expectations were about as low as they could get. The general consensus was the Knicks would be a bottom 5 team in the league. Some fans did not want to move on from the Carmelo Anthony era and then when a deal was made, fans were not exactly thrilled with the package in return. 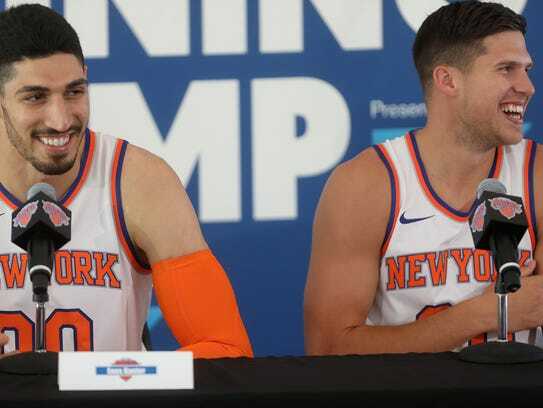 The Knicks were criticized and rightfully so but the criticism did not stop when the media and fans found out the return was Doug McDermott, Enes Kanter and 2018 second round pick via Chicago. Others believed Kristaps Porzingis was not ready to be the main focal point of an offense, more were irate over signing Tim Hardaway Jr. and even more were annoyed by the fact the team drafted Frank Ntilikina with the 8th overall selection over the likes of Dennis Smith Jr, Malik Monk, Donovan Mitchell etc. To be honest, these were all fair assessments but as it turns out everyone may been too quick to judge prematurely. Through 21 games, the Knicks have an 11-10 record and are tied for the final playoff spot in the East. The team currently has a positive point differential of 0.8 compared to last seasons of minus -3.7. The biggest change? The defense. The Knicks are giving up 103.8 points a game compared to the 108.0 points they allowed a year ago. The Knicks are holding opponents to just 43.8% from the field which ranks fourth in the league. Now, that’s only a small factor to the team’s current success. For the Knicks to win they need their four best players to play well. They need positive contributions from Porzingis, Kanter, Hardaway and Courtney Lee. Kristaps Porzingis has proven to be a legit star in this league. His stat line of 25.8 points (5th in NBA), 6.8 rebounds, and 2.1 blocks (leading NBA) has him as an MVP contender. Porzingis has been steadily efficient on the year with shooting splits of 46.7% from the field, 40.2% from three and 84.1% from the foul line. All are current career highs. With all the attention Porzingis is getting, and he is getting a ton as Porzingis has the third highest usage rate in the league behind James Harden and Joel Embiid, has allowed his fellow frontcourt mate, Kanter, to thrive.Kanter’s toughness and ability to play physical in the paint allows Porzingis to be a help side defender to protect the rim. Kanter is also a terrific rebounder pulling in 10.4 boards a night despite only playing 26.1 minutes a game. The second chance opportunities Kanter provides on the offensive glass (3.8 offensive rebounds a game which is 5th in the NBA) which allows his teammates to get second looks (second in the league in offensive rebounding percentage). It helps that Kanter is making everything he puts up. Kanter is shooting 64.3% from the field and has made 90.2% of his free throw attempts. The Knicks may have found the perfect playing partner next to Porzingis. Need a little more evidence on how important the duo are? The Knicks are 0-2 without Porzingis in the lineup with losses by 13 and 15 points. When Kanter sits? The Knicks lost three games in a row by 12, 15, and 12. The 15 point loss came when they both sat against the Houston Rockets. When the Knicks are able to have both players starting in the lineup, they are 11-6 and 0-4 when one or both misses a game. Enough on the frontcourt however, the backcourt has been playing above current expectations as well. The questions about Tim Hardaway Jr and his contract? Pretty irrelevant now. Sure, Hardaway is overpaid, no disputing that but he has performed well enough to justify the deal. Hardaway Jr game has improved much more as a ball handler, distributor and defender. Plus Hardaway has shown to be a capable second scorer on a team pumping in 17.8 points a night. His rebounds (4.2 per game), assists (3.3 per game), and steals (1.1 per game) are all career highs. The most surprising player this year has easily been Courtney Lee. Lee is having a career year in every major statistical category. The veteran guard is scoring 12.6 points, 3.8 rebounds, 3.o assists, 1.4 steals and is shooting 46.7% from three and 92.1% from the foul line. Did anyone see that coming when the season start? Nope. The real questions is when contending teams will start calling the Knicks about his possible availability. Lee still has 2 years remaining on his contract and makes a little over $11 million a year. A reasonable contract in today’s NBA salary cap for that type of production. Now not saying the Knicks may be interested in moving him but it’s a real possibility a team may fork over a pick for Lee. The Knicks are still clearly rebuilding so it would be wise to consider. Even the point guard play has not been the atrocity people expected. Jarrett Jack has been reliable and is 7th in the league in assist/turnover ratio at 3.5. Jack is not a long term answer by any means but has been a good mentor and moves the ball on offense. Speaking of long term answers, Frank Ntilikina needs fans patience. The young french guard is extremely raw on the offensive end and needs time to develop his shooting. His shot is by no means broken, it’s that Ntilikina needs to assert himself more and look for his shot more often. Too much he’s hesitant and pass first especially on pick and roll situations. That’ll come as he becomes more acclimated to the NBA game. Where he has been impressive though is his defense and court vision. Of all rookies, Ntilikina ranks second in steals (1.4 per game) and sixth in assists (3.3 per game) while playing about 10 minutes less than the players ranked above him. His ceiling is extremely high and the talent is there, it just needs to be developed and more refined. Knicks fans if you’re looking for hope and optimism heading into December, know there is plenty. The team may or not be a playoff team but they’ll be a competitive team if healthy for the entire year. Jeff Hornacek has the team bringing energy and effort which is a welcoming sign. The Knicks feed off the home crowd (10-4 at the Garden) and need to improve their game on the road (1-6) if they want to be playoff team come the Spring. In the meantime, Knicks fans continue to support this team as they very may surprise us throughout the whole year. They’ve done so already a quarter the way through.